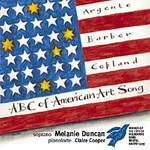 Melanie Duncan blitzed the 1999 Mietta Song Recital Award, winning the Popular Choice award and the Musical Partnership with her accompanist Claire Cooper, in addition to the Award itself. In her recital CD of 20th century American song her attractive coloratura voice highlights the beauty of Dominick Argento's "Six Elizabethan Songs", the vocal lyricism of Samuel Barber's French "Mèlodies Passagères" and the drama of Aaron Copland's "Twelve Poems of Emily Dickinson". Melanie's performance of the Copland captivated the judging panel during the final recital of the Award.